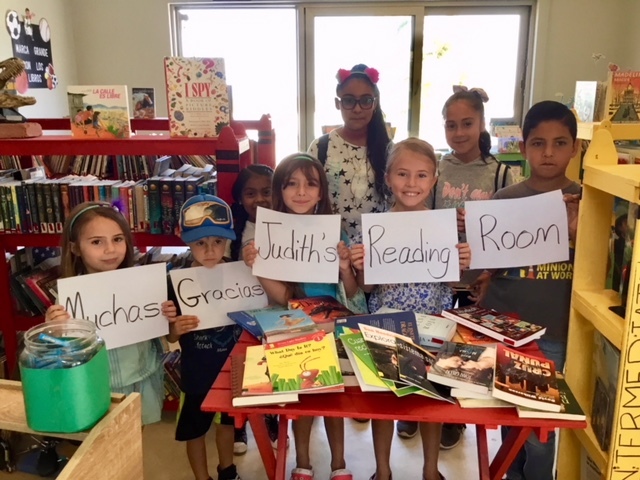 March 25, 2019 — Lehigh Valley, Pa. Judith’s Reading Room, established in 2010 to honor the memory and legacy of Judith F. Krug, a librarian, announced today that it has established a library containing over 400 books in the mountainous town of Zambrano in the Central American country of the Republic of Honduras. Lafayette College Librarian, Ana Luhrs, a former member of the board of directors of Judith’s Reading Room, recently led a group of Lafayette students to build a curated library for exceptional women selected by village elders to attend The Leadership Center (TLC) in Zambrano. Ana used the funds she was awarded as a winner of the organization’s 2018 Freedom Through Literacy Award to purchase books, among them autobiographies of women, and to create a culture of reading for pleasure. “Access to information beyond the classroom allows students to take ownership of their educational journey,” said Luhrs. “Library collections, especially well-curated collections, provide a variety of perspectives beyond that of a classroom textbook and an instructor,” she added. “Judith’s Reading Room stands with the dozens of young women hand-picked to learn management and leadership skills at TLC so that they can become highly productive leaders in their country,” said Cathy Leiber, Co-Founder, Judith’s Reading Room. “Thanks to Ana Luhrs, having a library at TLC which is packed with books to encourage a love of reading, students will be able to explore the world when there is little opportunity to leave their country,” added Leiber. April 16, 2018 — Lehigh Valley, Pa. Judith’s Reading Room, a non-profit organization founded in 2010 to enrich lives and societies by proactively encouraging freedom through literacy announced today the opening of its 96th library in its 19th country with The Palapa Society of Todos Santos, Mexico. The Palapa Society of Todos Santos is a non-profit whose mission is to create prepared 21st Century learners. The organization was a 2017 Judith’s Reading Room Freedom Through Literacy Award winner and received a check in the amount of $500. With that, they purchased approximately 50 children’s books in English and Spanish including BFG by Roald Dahl and Frida by Jonah Winter. The 2018 Judith’s Reading Room Freedom Through Literacy Award application process is underway. The 2018 Award will grant $4,500 in prizes. The deadline to apply at www.JudithsReadingRoom.org/APPLY is July 6, 2018. Since its inception, Judith’s Reading Room has dedicated 96 libraries in 19 countries with 127,679 books worth nearly $1.4 million dollars. The Freedom Through Literacy Award has disbursed $24,500 and has honored 19 individual champions of literacy in the United States, the Philippines, Bhutan, Pakistan, Rwanda, Cambodia and Mexico. July 24, 2017 — Lehigh Valley, Pa. — Judith’s Reading Room proudly announces this year’s Top Prize winner of its 3rd annual Freedom Through Literacy Award is Lisa Lucas, National Book Foundation, New York, for their 10 year old literacy project titled, “BookUp.” BookUp is a reading program that serves more than 500 middle school aged children, older teens and young adults, led by published writers in four states. Students discuss quality literature in a book club format, go on field trips to cultural institutions and receive free books to build their home libraries. The Top Prize award is valued at $3,000. William Whipple, Easton, Pa, will receive $1,000 for his passionate work with TEACH Rwanda and its project called, “Stories in Kinyarwanda.” Children’s literature in Rwanda is an emerging endeavor and TEACH Rwanda is determined to improve the quality and accessibility of culturally genuine, captivating Rwandan literature for young children. TEACH Rwanda was also a Runner-Up in 2016. This year’s Honorable Mention is awarded to The Palapa Society of Todos Santos, Mexico. Founded in 2003, this grassroots nonprofit promotes the “love of reading” and bringing literacy to communities without the means or access to books given their high cost and limited availability in Mexico. To support their children’s library, Judith’s Reading Room will purchase $500 worth of new books. Judith’s Reading Room, a literacy nonprofit based in the Lehigh Valley, Pa, was founded in 2010 in memory of Judith Krug, first cousin to the founders. Judy, a librarian, dedicated her 40 year career at the American Library Association to protect the freedom to read. The mission of Judith’s Reading Room is to enrich lives and societies by proactively encouraging freedom through literacy. To date, the organization has fulfilled that mission by shipping more than 127,000 books to deployed troops and dedicating 95 libraries in 18 countries with books valued at nearly $1.4 million dollars. July 5, 2017 — Lehigh Valley, Pa. Judith’s Reading Room, a nonprofit literacy organization founded in 2010, reminds the public that the application for its 3rd annual “Freedom Through Literacy Award” is Friday, July 7 at midnight. The application is available at www.judithsreadingroom.org. The Award honors individual champions of literacy from all disciplines around the world — teachers, librarians, authors, researchers, educators, literacy non-profit leaders — anyone who has done exemplary work to instill in others a love of reading. Top prize is $3,000 and one runner-up will be awarded $1,000. An honorable mention will be eligible to win $500 value in new books. One change marks the 2017 Award: First, Judith’s Reading Room will accept “nominations by self” and also nominations for others. Therefore, if you are a student or a parent of a student and you love your teacher or librarian: nominate them! Since its inception, Judith’s Reading Room has established 95 libraries in 18 countries filled with more than 127,000 books valued at nearly $1.4 million. Judith’s Reading Room founded the “Freedom Through Literacy” Award in 2015. December 21, 2015 — Bethlehem, Pa.
Leiber, President of the nonprofit organization, Judith’s Reading Room. exemplary work to instill in others a love of reading. Bethlehem, Pa. – September 8, 2015. Judith’s Reading Room will celebrate today’s International Literacy Day by packing children’s books at its 63rd Boxing Party, at 5 E. 3rd Street, Bethlehem from 5:30 to 7 p.m. Citizens and volunteers are expected to fill the room in the effort to share literacy around the world. Boxers will pack children’s books for Nazareth, PA native, Andrew Berry, former Barnes & Noble associate now stationed with the Peace Corps in the Kyrgyz Republic. This will be Judith’s Reading Room’s 92nd library. Tonight’s effort to ship a box of 100 books to Risbek Aidarliev School will help Andrew get his English Club off the ground, where there are 902 students supported by 59 teachers, two of whom are English teachers. “The primary mission for my Peace Corps service is to improve the English levels, of both the students and teachers. I will use these books to organize a reading club for interested students. A book fair in the spring will actively engage students in learning through reading. Students will give presentations about books they receive from Judith’s Reading Room,” said Berry. Books will be shipped to Judith’s Reading Room libraries in Romania where today English “competitions,” using books provided by the organization are being held in honor of International Literacy Day. The organization’s 93rd library will open in Lahore, Pakistan as a result of books packed tonight. They will be shipped to Alif Laila Book Bus Society, winner of the 2015 Freedom Through Literacy Award.